THE RYAN McBride Foundation insists they want a quick resolution to their proposal to rename Brandywell Stadium after the former Derry City captain who died tragically in March 2017. 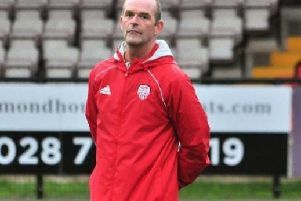 At a public meeting in the Gasyard Centre on Wednesday night, over 100 people turned out to express their views on the proposed plan to re-brand the Brandywell venue in honour of the much loved Candy Stripes skipper. The Foundation set out their seven point proposal which has proved divisive and there were a broad spectrum of opinions voiced - both for and against - from residents of Brandywell and supporters of Derry City - one of the major stakeholders. There has been a five member working group consisting of elected representatives appointed by Derry City & Strabane District Council, tasked with engaging with the public and the main stakeholders. It’s expected the working group will meet with Council at the end of January and the Foundation hope it will then get the green light before Ryan’s first anniversary on March 19th next. Foundation representative, Gareth McCay claimed the public meeting was ‘constructive’ and he remains hopeful the renaming of the stadium will come to fruition. “It went exactly how we perceived it would go,” he said. “There were strong opinions on both sides and we obviously appreciate the input - that’s why we were here. “We could’ve had the meetings in dark rooms but we’ve opened it up to the community and we’ve heard from both sides. We’ll go away and try and find a meeting in the middle where we can keep everybody happy. Several Derry City supporters at the meeting made their concerns clear with some suggesting the renaming of the stadium after Ryan was ‘creating a hierarchy’ of past players who represented the club. We will look at different proposals but I think naming the Southend Park stand after Ryan isn’t going to happen. One City supporter warned that, should there be a repeat of the violence and anti-social behaviour that occurred at the stadium in the past, then Ryan’s name would be ‘dragged through the mud’. Mr McCay, however was hopeful the naming of the stadium after the ex-City skipper would mean the area would feel more of an attachment with the stadium and anti-social behaviour would dissipate. When asked if the Foundation has a ‘Plan B’ should the proposal be rejected by Council, Mr McCay said the family were prepared to look at different proposals. “The family’s view is they don’t want the Southend Park Stand with Ryan’s name on it,” insisted Mr McCay. “While there is work being done to it , I think everyone in the room accepts it’s not in a great condition. It just wouldn’t be right to put Ryan’s name on something in that condition. We will look at different proposals but I think naming the Southend Park stand after Ryan isn’t going to happen. “Leaving Derry City to one side, and I appreciate they are probably the main stakeholders, Ryan is a boy who is from the Brandywell. He was born seven doors down from the stadium. He died seven doors down from the stadium and spent every one of his 27 years living there. “Nobody ever thought he was good enough and he didn’t get there until he was 19 and ended up becoming captain of the team through sheer grit, determination and hard work. Towards the end of the meeting a potential compromise was suggested by a Derry City fan to name the stadium ‘The Ryan McBride Brandywell Stadium’ which was largely met with approval by the attendance and the Foundation. “That single comment had made the evening worthwhile because it was a constructive comment that we can go and have a look at.